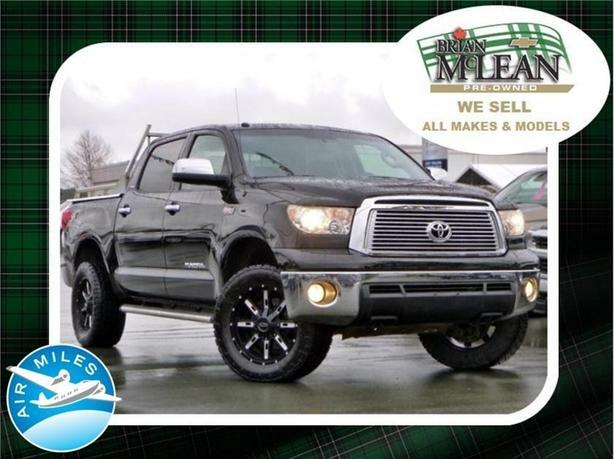 This2010 Toyota Tundra is a full-size, half-ton pickup truck offered in the top of the line Platinum trim level. Features includepower-sliding rear window, full power accessories, fold-up rear seats, cruise control, bucket seats, a console-mounted shifter, a tilt-telescoping steering wheel,alloy wheels, a utility rail system for cargo, automatic climate control, an upgraded sound system with CD changer, satellite radio, iPod connectivity, Bluetooth, steering-wheel audio controls, front and rear parking sensors and power-adjustable leather seats that are also heated or cooled for all seasons. Powering this Tundra is a 5.7L V8 gas engine that produces381 hp and 401 lb-ft of torque.Antilock disc brakes, traction control, stability control, front-seat side airbags and full-length side curtain airbags are all standard, as are front-seat knee airbags for 2010. For Sale at our Brian McLean Chevrolet Buick GMC store located in Courtenay, BC. Please contact us for finance/purchase options and further details. Trade-ins welcome. ** Serving communities on Vancouver Island for over 25 years, Namaimo, Parksville, Qualicum, Duncan, Victoria and many customers on the mainland in Vancouver and as far as Kelowna. Ask about our travel assistance for out of town buyers!! !